This week: This time, I think about the effects of special annual Halloween events in computer games. Due to Halloween’s popularity, it also got adopted by the media. For instance, several horror movies evolve around this special event and many comedy series feature special Halloween episodes. One of the most famous examples are the The Simpsons – Treehouse of Horror special episodes that aired annually since the second season of The Simpsons. Naturally, a similar adoption took place in the computer game industry as well. 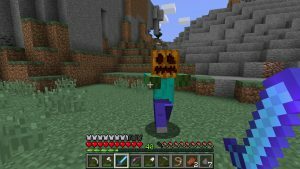 Aside from the emergence of special Halloween-inspired horror games, several computer games received annual events allowing the players to celebrate Halloween in their favorite virtual worlds. Hallow’s End in World of Warcraft. The probably best example is World of Warcraft that received a Halloween-inspired annual event in October 2005. 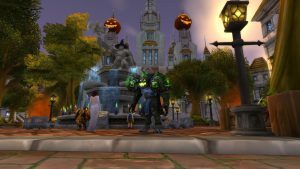 Since then, players can celebrate the Hallow’s End event on an annual basis by defeating special event bosses, collecting sweets by trick-or-treating and wearing spooky costumes or masks. In addition, the entire virtual world of Azeroth gets decorated with jack’o’lanterns, spooky candles, skeletons and other Halloween decorations during this particular events. Aside from adding new and exciting game mechanics to an existing game, those special events also make the virtual worlds more authentic and immersive. Without those special events, the virtual worlds would just be static environments that always look the same throughout the whole year. However, with the implementation of special events, the virtual environments start to change the same way as the real world, thus making it more believable and realistic. Moreover, special seasonal events provide the players with new content and, more importantly, new experiences that ultimately result in more fun and that’s what it is all about when it comes to playing a game. This week: This time, I think about a special viewer group that only watches a Let’s Play series of a particular game and starts to demand more content when the content creator likes to drop the series. Like any other computer game player, YouTubers who create Let’s Play videos (LP) stop playing a particular game when they have beaten the game or exhausted most of the game’s challenges. At this point, they move on to a different game that is more enjoyable and provides new challenges to the content creator. Although this sounds like the natural progression of playing computer games, it can have surprising side effects for the YouTuber when there is a huge group of viewers that were just watching because of the video series featuring this particular game. Normally, one would assume that viewers follow a YouTuber because they like his style of playing games or commentating the own gameplay. Those viewers usually enjoy any series the YouTuber creates and are always looking forward to the start of a new series as this mostly shows a completely new aspect of the player. Of course, some of the games a content creator plays might not be as interesting and, as a result of this, they skip watching this series. However, those YouTuber-centric viewers (YCV) are just one classification of viewers as there are also viewers who are only interested in a particular game. In contrast to the YCV, game-centric viewers (GCV) only care about one game and ignore all the other content the YouTuber releases. This situation works well as long as the content creator continues to release videos about the GCV’s game. During this time, both relevant viewer groups are pleased with the YouTuber’s work as it satisfies their demands. Unfortunately, as soon as the GCV’s series is dropped, they feel ignored as their demands are no longer satisfied. Some of them might give some of the other video series a try, but most of them will stop watching the YouTuber’s videos entirely or even start to complain and demand more videos of this particular game. As a result of this, the content creator faces a difficult problem as there is suddenly some kind of pressure to continue playing a game that already has become boring and hence ceases to be fun. In addition, the content creator most certainly will observe a significant drop in the total amount of views and start to ask himself if something is wrong with the current video releases. In sum, there is no ideal solution to this problem. If the YouTuber gives in and continues to produce videos of the game, it will satisfy the demands of the GCV, but can completely ruin the content creator’s opinion of that game. Also, it can have a negative impact on the content’s quality and hence disappoint the YCV. If the YouTuber does not return to the game, he will have to deal with all the demands for a continuation, but will also be more happy with the games he plays which ultimately satisfies the YCV. Unfortunately, this will most like come at the price of losing a good portion of views per month. In the end, I wrote this article in order to raise the awareness for this problem. YouTubers are also just humans and hence their interests might change over time. Constantly demanding the continuation of a series is of course understandable, but in the long run, it will cause a lot of damage. Naturally, some games are really entertaining to watch, but it does not hurt to try out different series a content creator produces as they might be very interesting, too. This week: This time, I think about the aesthetics of imperfection that are mostly found in a player’s first gameplay of a particular game. In most of the cases, players of building games, such as Minecraft and Cities: Skylines, want to achieve ideal results that look very refined and/or are very efficient. In order to do so, players constantly improve certain elements until they find an ideal way to realize their goals. Often, those games also allow the construction of new projects in the same virtual world enabling them to easily compare older projects with current ones in order to learn from their mistakes and to see how their performance has improved over time. However, the prime goal of achieving ideal results, which is often rewarded by the game, too, takes away the very asthetic element of imperfection. For instance, old cities or old houses mostly are interesting as things are not done in an ideal or very streamlined way. Instead, they are results of a development process that happened naturally and/or without a clear plan. Interestingly, the special element of imperfection can often be found in a player’s first gameplay as most game mechanics are still unknown to the player and hence the development of a building or city also happens in a very natural way. Like in the real world, players try to change minor things in order to improve certain elements or fix particular problems of their projects and hence a natural progression takes place. In the end, a player’s first game might not be very streamlined or ideal but offers the same aesthetics of imperfection as many things in the real world. However, as soon as a player starts a new game, they already have a good knowledge of the game mechanics and can try to approach the game with a clear plan in mind in order to achieve a very streamlined and perfect outcome. Although this can also be very interesting, the results often lack of a unique character and feel sterile. Personally, I often notice that I really enjoy the first time of playing such a game as the results seem very authentic due to the imperfections. However, as soon as I start a completely new world, I begin to play with a certain plan in mind but often lose interest after a relatively short while as the results start to feel unnatural. This might also be the reason why I still play in the exact same Minecraft world I created as I bought the game some years ago. This week: This time, I think about Elon Musk’s vision for colonizing Mars. On 27 September 2016, Elon Musk revealed his vision for colonizing Mars within the next 50 to 100 years by offering relatively cheap flights to the Red Planet. For this purpose, SpaceX works on the development of completely reusable spacecraft and booster that will ferry astronauts and colonists to Mars. The principle behind this idea is very simple and follows today’s commercial aviation. Flights all around the world are only that cheap as each aircraft is used for thousands of flights thus allowing airlines to spread the price for each aircraft across many passengers. Provided SpaceX can afford to fund the development, the first test flights could already launch within the next decade. The mission profile for a flight to Mars sounds very ambitious but also possible. The idea is to launch the main Interplanetary Travel System (ITS) with only so much fuel on board so that it can barely accellerate to orbital velocity in order to have as much cargo capacity as possible. While the ITS is still on its way to Low Earth Orbit (LEO), the first stage will return and land again at the launch pad in order to get refueled and to launch a tanker into LEO which subsequently will rendezvous with the ITS in order to refuel it. Once a launch window opens, all ITS that are parked in LEO will depart at the same time and basically fly in formation to Mars where the ITS will enter the Marsian atmosphere and finally perform a propulsive landing. This propulsive landing system also enables an ITS to land on almost any celestial body as no atmosphere for parachutes is needed. Aside from developing the spacecraft, SpaceX is also working on systems that will generate rocket fuel on the surface of Mars in order to refuel the ITS again thus allowing them to fly back to Earth. For this purpose, SpaceX is also designing a new type of rocket engine that burns a mixture of densified liquid methane and liquid oxygene. The advantage of this type of rocket fuel is that all the required ingredients can be found on Mars. In the end, Musk’s vision sounds, at least when enough funds are available, possible. However, Elon Musk has not addressed how the first sets of colonists will survive on the surface of Mars after their arrival. Also, Mars‘ surface gravity is only about 1/3 of the Earth’s surface gravity which might be very funny during the first weeks on the planet but can also have negative side-effects on the human body when it is exposed to those conditions for several years. It would be an incredible adventure. I think it would be the most inspiring thing that I can possibly imagine. And life needs to be more than just solving problems every day. You need to wake up and be excited about the future. And be inspired, and want to live. 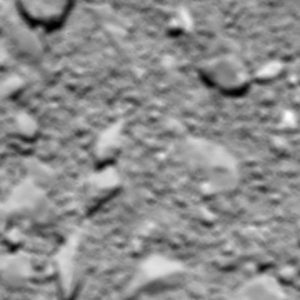 This week: This time, I think about Rosetta’s landing on Comet 67P/Churyumov-Gerasimenko. On 6 August 2014, we all cheered as Rosetta became the first spacecraft that successfully entered into an orbit around a comet. That day, the European Space Agency’s orbiter arrived at Comet 67P/Churyumov-Gerasimenko after a 10-year long journey through our solar system. Throughout this long journey, Rosetta did three Earth and one Mars gravity assists in order to accelerate to a speed that allowed it to ultimately rendezvous with the comet. Only three months later, on 12 November 2014, we all cheered again as the small lander ‚Philae‘ that was riding piggyback on Rossetta seperated from the orbiter and began its 7-hour long descent to the surface of the comet. 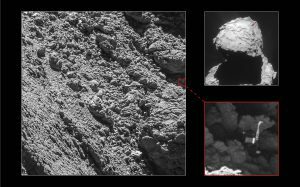 It was the first attempt ever to soft-land a spacecraft on the surface of a comet in order to analyze some surface samples and to take close-up pictures of the comet’s surface. Despite experiencing some technical issues that resulted in the lander bouncing across the surface, the landing was a success. Unfortunately, Philae landed in a spot that provided not enough sunlight to keep the lander’s batteries charged, but the spacecraft managed to carry out 80% of the planned experience before it ran out of electric charge. 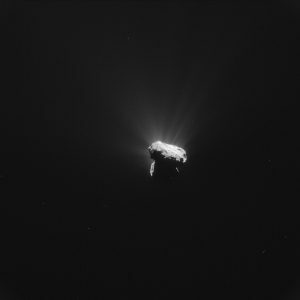 Since then, Rosetta continued to orbit Comet 67P in order to analyze the comet and to collect valuable data that already allowed scientists to learn more about the formation of our solar system. In addition, the orbiter observed the changes in the comet’s activity as it got closer to the sun. On 13 August 2015, the comet arrived at its perihelion and began to increase the distance to the sun again. Recently, on 2 September 2016, Rosetta managed to find Philae on the comet’s surface, thus allowing the scientists to put its condition into perspective. Unfortunately, the Rosetta mission had to come to an end on 30 September 2016 because the spacecraft was getting farther and farther away from the sun. Soon, the reduced amount of sunlight would not have been enough to generate the power needed to keep the spacecraft running. However, instead of letting the orbiter slowly die, the Rosetta scientists decided to end the mission with a grand finale: a landing on the surface of the comet. During the final approach, Rosetta was collecting as much data as possible in order to provide the scientists with insights into the atmosphere of the comet as well as with spectacular close-up pictures as the spacecraft got closer and closer to the surface. In order to make sure that the spacecraft would be passivated after the landing, the engineers uploaded a final patch during Rosetta’s last days that ensured that the spacecraft will shut down as soon as it measures a drastic change in its attitude due to the contact with the surface. For the last time, on 30 September 2016, we all cheered for the orbiter that has achieved so many milestone and we eagerly expected the last set of images from Rosetta that provided new and spectacular insights into the surface structure of the comet. Finally at 13:19 CEST, the signal to Rosetta was lost. Due to the huge distance of 4.81 AU to the spacecraft, the signal had a delay of 40 minutes and hence the landing must have occured around 12:39 CEST. Rosetta achieved a lot of milestones and inspired many people all around the world. Now, the orbiter came to its final rest and is basically reunited with Philae. Thank you Rosetta, thank you ESA!